With the General Pest Service, you not only get pest control that you can count on, but you get careful inspections, professional advice and courteous service. Best of all, when the service is completed, you get a written 60 day warranty. 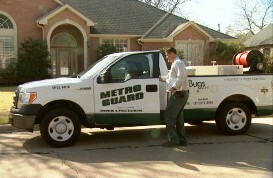 So when you choose Metro Guard you know your pests are gone! Service Summary:We inspect the entire outside of your home looking for pests like ants, termites, spiders and signs of rodents. 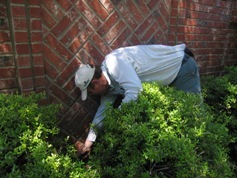 The pest inspection is an important part of the General Pest Service. We treat the entire outside of your foundation to protect against insects that crawl up the outside of your home looking for a way in. Our inside treatment includes treating your plumbing areas because insects require moisture. We treat every accessible room in your home and the garage is included. We also inspect accessible attics to ensure that there are no signs of rodents or insect infestation. The General Pest Service is not just for homes with current pest problems. This service is most effective as a preventative. Insects are constantly searching for places to live that offer food, shelter, water and an acceptable climate. As insects forage into your home and cross a treated barrier, they are eliminated preventing reproduction and major infestations. So don’t wait, it’s a great service for $59.95.